Should I Buy a House in 2018? Supply and demand plays a role. When there are not many homes for sale (low inventory), this often means home prices are higher, and the market becomes more competitive for buyers. This is the case in 2018. However, inventory levels have been steadily increasing June-August this year, and actually surpassed August 2017 levels. If inventory levels continue to increase, that’s a good sign for buyers for the remainder of 2018. Inventory of homes for sale will affect pricing. More homes for sale will typically drive down prices, where as low inventory of homes for sale typically means there is higher buyer demand, and it will usually push prices up. This is the case in 2018 where most markets are experiencing low inventory and higher prices. The existing home price increase in August 2018 marks the 78th consecutive month of year-over-year price gains according to the National Association of Realtors. Some early estimates for 2019 show that home prices will continue to increase around 3% in most markets. Great if you’re selling a house, but challenging if you’re buying. It makes buying in 2018 look even better. House prices typically drop the longer a home stays on the market. When this happens, it’s a good sign the market is cooling off or correcting. This year, in most markets, homes have sold relatively fast. This means potential buyers need to have their ducks in a row so they can act fast on the home they want. According to Realtor.com, it’s the perfect time to buy a house because fall and winter tend to be better for home buyers, and this year is no exception. Housing inventory is on the rise, and that may mean lower prices and more bargaining power for buyers. That, combined with sellers who are anxious to get the sale done before the holidays, makes fall and winter a great time to buy. The interest rate is a big topic of conversation this year, and probably one you’ve kept top of mind when asking, “Should I buy a house in 2018?” The Federal Reserve has raised interest rates a couple of times this year. Two or three more rate hikes are being predicted, which may mean a more expensive mortgage for you. In September, the rate for a 30-year, fixed-rate mortgage jumped to 4.88 percent, which is the highest level for the 30-year mortgage since 2011, according to Bankrate. But, you need to understand this is still well below the average over the past 45 years outlined below with FreddieMac data since 1972. 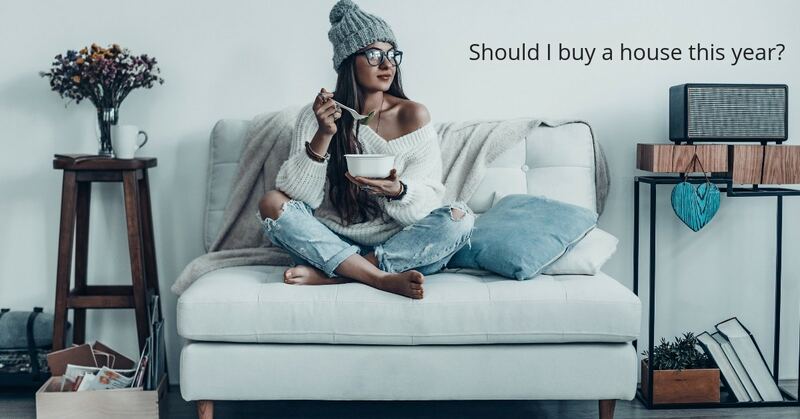 Trying to time your home-buying decision to take advantage of low interest rates or a buyer’s real estate market are smart home-buying strategies, but the real question is: Is it the right time for you, personally, to buy a house or maybe it would be better to rent? The interest rate can be as low as it’s ever going to go, but if your credit score is shaky, you’re not going to be able to take advantage of that. People with lower credit scores pay higher interest rates, and the amount can add hundreds to your monthly mortgage payment. Improving your score, no matter what the market is doing currently, is the smarter way to go. If you haven’t checked your credit lately, you might want to take a look at it. Last year, credit reporting companies announced they were changing the way they handle negative information, resulting in many people seeing a spike of up to 40 points on their credit score. This overhaul was caused by the Consumer Financial Protection Bureau, which found problems with the reporting of collections and tax liens and as a result, that data has been removed from millions of credit reports. However, particularly for home buyers, a tax lien or civil judgement can still interfere with your ability to get a loan. LexisNexis Risk Solutions found that people who have a tax lien or judgement are five and a half times more likely to go into pre-foreclosure or foreclosure, so mortgage lenders may well pull a LexisNexis report to find out, even if it no longer appears on your credit report. FICO scores (credit scores) range from 300 to 850. If yours is 700 or above, you’ll qualify for a better interest rate on a loan, so that’s the score you’re shooting for. Pay down your credit card bills to show only 10 percent of your limit. If your card’s limit is $1000, your balance should be no more than $100. Doing this will increase your score almost immediately. Make all of your payments on time. One late payment can drop your score up to 100 points, but on-time payments will raise it. Check your credit report for errors. If negative information exists and you don’t recognize the account or the charge, dispute it. Never close a credit account. Even if you don’t use it, keep it open. Closing an account can negatively impact your score. If you have an account in default, request a “pay for deletion.” It’s an agreement made with your creditors that you’ll pay a debt in full or an agreed-upon amount in exchange for them deleting the negative information on your credit report. Simply paying off your debt will not raise your score unless the creditor deletes it from your record. Most financial experts agree that your housing costs should be no more than 30 percent of your income. Can you find an affordable home based on what you’re earning now? Also look at your debt-to-income ratio. If you’ve got a high amount of debt and a relatively low income, it will be more difficult to get a home loan. Pay down your debt before applying. However, there has never been a better time to increase your income by finding a new job. Unemployment is at an 18-year low, which means it’s a job seeker’s market out there. Take a look at the average salary range for your position in your area to gauge how your employer stacks up. Do You Have Enough for a Down Payment? Experts recommend putting down 20 percent or more. Why? There are a few reasons. If you put less than 20 percent down, you’ll have to pay private mortgage insurance, which, on a $300,000 loan, will cost you an extra $250 each month. Another reason to make a larger down payment is to protect yourself in the event that you have to move shortly after you purchase the home, if you get a new job in another city or if your spouse is transferred, for example. With a small or nonexistent down payment, you might find yourself underwater, owing more than you can sell the home for, if real estate prices have fluctuated. Do You Have Enough for Closing Costs? In addition to the down payment, you’ll need money for closing costs. According to Motley Fool, you can expect to pay around 2 to 5 percent of the value of the property. So on that same loan of $300,000, you’ll pay in the neighborhood of $6,000 for closing. And, if you’re still asking yourself, “Should I buy a house in 2018,” don’t forget to consider having enough cash on hand to cover your mortgage if you or your spouse loses a job, and have enough in savings for repairs if something goes wrong or breaks. Bottom line, do your homework. Review these items and get to know your personal situation so you are prepared to discuss everything with a real estate and mortgage professional when your ready, whether it’s in 2018 or not. Wondering How to Get a Mortgage and Stop Paying Rent? Ready to speak with a specialist, committed to heroes like you? Sign up and speak with one of our real estate or mortgage specialists in your area to learn more about how they can help you through the home-buying process and maximize your hero savings. Our heroes save, on average, more than $2,400 if they use our local specialists to purchase their home. There’s no obligation, and we guarantee the most hero savings among all national programs.